In June 2017, CBS renewed The Young and the Restless TV show for three seasons but the soap opera’s sister show, The Bold and the Beautiful, wasn’t as lucky. It was presumed that the latter series would be renewed for the 2018-19 season but, these days, one can’t assume that soap operas are safe. Today, CBS confirmed that The Bold and the Beautiful has been renewed for season 32 for the 2018-19 broadcast season. According to the network, the new season debuts on Monday, September 17th. The network also announced that season 46 of The Young and the Restless will debut will debut on Monday, September 3rd. THE YOUNG AND THE RESTLESS, the #1 daytime drama for 29 consecutive years, premieres Monday, Sept. 3. THE YOUNG AND THE RESTLESS is averaging 4.75 million viewers. The series, which is entering its 46th season, is broadcast weekdays (12:30-1:30 PM, ET/11:30 AM-12:30 PM, PT) and is produced by Bell Dramatic Serial Company, in association with Sony Pictures Television. Mal Young is the executive producer. 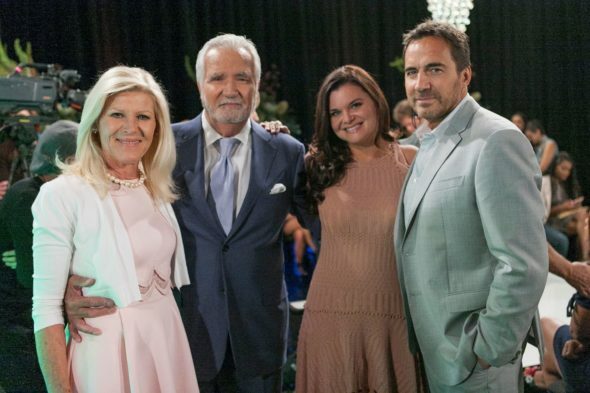 THE BOLD AND THE BEAUTIFUL, the most-watched dramatic serial in the world, premieres Monday, Sept. 17 and will celebrate its 8,000th episode during its 32nd season. THE BOLD AND THE BEAUTIFUL is averaging 3.80 million viewers. The series is broadcast weekdays (1:30 PM-2:00 PM, ET/12:30-1:00 PM, PT). It is a Bell-Phillip Television production. Brad Bell is the executive producer. What do you think? Are you a fan of The Bold and the Beautiful and/or The Young and the Restless TV shows? Do you watch these CBS shows on TV or online? I believe you may be taking a wrong turn. Please stop drawing every episode out so long that it becomes trite/unbelievable. Right now, please get Hope’s baby back to her: pronto….and get on with what you have done in the past: strong storytelling. Your current scripts are weak. BTW: where is Thorne?? Another unbelievable story twist. Let’s get back to REAL! I love Y&R and the B&B. I hate it when the weekend comes around because I know it will be 2 loooong days before I get to see my shows. I am not the only one that feels this way. PLEASE DO NOT take them off the air. Leave them shows alone let them stay. Most of us work and DVR it it’s not fair you don’t get those ratings too!! Someone told me that CBS will no longer air The Bold and the Beautiful in a couple of months, does anyone know anything about this? Is it just a rumor or true? I have been watching for so many years now and tape every episode because I work. Please don’t take off BB. I could care less about Y & R…I’m just bored with it and it’s too long and drawn out. Shorten Y & R, increase BB to an hour please. The Bold and the Beautiful and Y and R do a great job of story telling. I’m a big fan of both shows. It would be nice to see another crossover story line. My wife and I watch this show together everyday at lunch. We are 57. When I was 54 I had a kidney transplant. We started watching this together we love it. I love the show but you need to come up some different stories. I am sick of Brooke and Hope. Guess I am a Stephie fan. Give her a new man. Don’t take the show off.